Over the last six months, I’ve been working closely with Ray Wang who is well known in the CRM space as an expert. 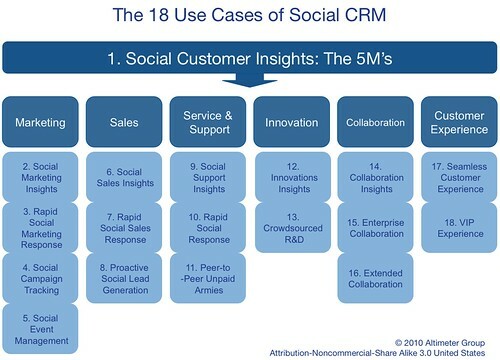 Coupled with my focus on social technologies we did a deep dive on how our worlds are colliding into the trend to Social CRM. In our opening webinar when we announced our joining of the firm, we made it clear we’re looking at the holistic business, across multiple business departments –not silos or roles. For companies, real time is not fast enough. Companies need to be able to anticipate what customers are doing to say and do, in order to keep up. Although Motrin responded to angry mom’s within 24 hours –it was too slow. Companies are unable to scale to meet the needs of social. No matter how many community managers Dell and ComcastCares hires to support, they’ll never be able to match the number of customers happening. They need tools, and they need them now. Customers don’t care what department you’re in they just want their problem fixed. Dooce’s support problem with Maytag quickly became a PR nightmare –had the support group known she was an influencer (and what it means), they could have serviced her better. Regardless if you’re in IT or in a business unit, we wrote this to meet the needs of both groups. This architecture lays out all the possibilities (18 use cases) defines the problem and goal for each, and suggests some vendors who to watch. It’s also pragmatic, as it lays out a process on how to get started, baseline needs (listening) and what to do next. Sign up for the webinar series. This is a deep topic, and the report is only the tip of the iceberg. As we’ve done in the past, we’re going to offer a series of free webinars on this topic to explore each of the use cases in gritty details. Sign up for the webinar now, as we can only have 1000 attendees per webinar, as our last webinar had over 1100 registrants. Read then spread this report. Like open source, the Altimeter Group believes in open research, we want our ideas to grow, and others to take advantage of it. So if you found the report helpful, please forward the report to internal constituents, partners, vendors, clients, and blog it. Use it in your presentations, business plans, and roadmaps. I’ve embedded it below, and there are download features for your own use. Have an internal discussion. Evaluate your current situation at your company, then draw up which business needs need to be tackled first, use the use cases as a roadmap by mapping out which phase comes first, and which phase comes second. Altimeter is unique as our partners can tightly co mingle our topic areas and see how they converge, we highlighted our vision when we joined. We seek to be stewards of community and during our six months of research we talked to way over 40 thought leaders, vendors, and companies that are approaching this space. We blogged ideas, engaged in conversations with the #scrm hash tag, and had working sessions with thought leaders like Paul Greenberg and Esteban Kolsky. We approached research in an open way, and allowed for vendors to review the report and submit back their ideas, some of which we incorporated. This effort was a group effort and included a lot of heavy lifting from Christine Tran, operations who helped to schedule countless meetings, and guidance from Charlene Li, our founder. We see that worlds are converging, and we model our research the same way, through really analyzing the mixtures of our different topic areas. For example, what was interesting is that my ‘marketing-speak’ and Ray’s ‘IT Speak’ often resulted in the tower of babel. Although we were talking about the same topic, he had to translate IT and marketing speak both ways. After many puzzled looks, we embracing this, and realized that this isn’t unique to us but a sign of companies converging as a result of mass adoption of easy to share social tools. Thus, we realized this framework that could meet the needs of the various camps would be helpful, companies need to move quickly, as customers have adopted social in rapid fashion. We want ideas to spread, and have made the entire report available at no cost on slideshare, and put up images on flickr, we hope you use them, under creative commons licensing of Attribution -Noncommercial – Share Alike Status, we believe in open –not closed research. We’re trying a different business model, we want to involve the community of experts and publish our findings out there for everyone to benefit from, please support us by sharing it as much as possible, while we trial a new way of doing research. Update: I forgot to mention, this report was entirely funded by the Altimeter Group there were no sponsors. Also, we are open about disclosing who are clients are (providing they approve), as a result, we hope you’ll trust as more. Gauravonomics builds off of our use cases and creates a matrix, well done. Prem, one of the thinkers in this space says the report helped to crystalize thinking, read his review. More thinking about gurus and vendor control in this post and comments. Stefano takes the use cases and aligns them with the Groundswell objectives, interesting. Our friends over at Web Analytics Demystified, also a research and consulting boutique, notice our pragmatic approach. I’m working on a report with them, stay tuned. Paul Greenberg discusses the changes the report has caused, and makes some suggestions, thanks Paul. He also reviews the use cases, and points out other reports. Dennis Howlett gives a critical review, requesting more use cases that have direct impacts to the bottom line. Fair enough feedback. Filiberto reviews the report, and gives some strong cursory reviews. Well respected analyst Rachel Happe covers the report and seeks definitions around SCRM in relation to collaboration. Short answer? A company must first love itself before it can really love their customers. InsideView takes a look at this from a sales perspective. Ross Dawson, looks at this from both an industry analyst perspective. Andy Sernovitz, who runs the social business council says this was the most viral B2B report ever, and details out the tactics we used. Should there be SIX Ms? Onetoone media has some suggestions why, do see my comment. Update: March 10th, From behind the scenes, we’re hearing of SCRM vendors and brands that are interested in deploying are using the framework as a roadmap, market requirements doc, and as a plan of what to do. Excellent.